I hope you are having a great weekend. On this side of the world it is over. *sigh* I can't believe the whole long weekend thing was not all that long after all. I had a long to do list, including starting Facebook Page for Color Me Loud (have you liked it yet?) and depoting 10 limited edition MAC eyeshadows. The latter was done at 2 am in the morning on Saturday night. I stuck the knife a few times in the eye shadow pan, they now have a few small holes but they are usable. Bad news is that I forgot to get magnetic sheet so they fall out from the palette. I have been writing some longish posts lately and started getting a little exhausted. I am considering to get tomorrow off after showing you Chanel Summer Collection Stylo Eye Shadows. I liked the previous versions a lot (reviewed here and here) and used them often for the last years so I decided to splurge on all the shades when I saw them at tax free shop in Schiphol Airport. I wouldn't get the blue one, #117 Azulejo but I couldn't leave just one behind (you know this psychology?). 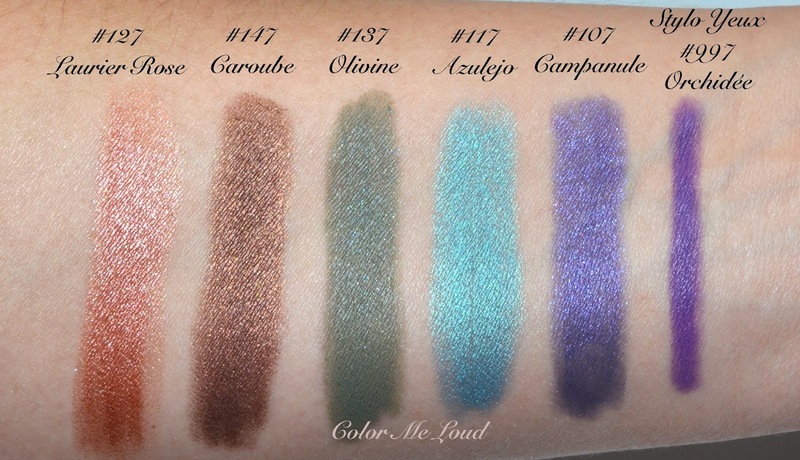 So here are my thoughts about Chanel Stylo Eye Shadow #107 Campanule, #117 Azulejo, #127 Laurier Rose, #137 Olivine, #147 Caroube. There is also one Style Yeux called #997 Orchidée which is a gorgeous purple, which of course had to come with me too. 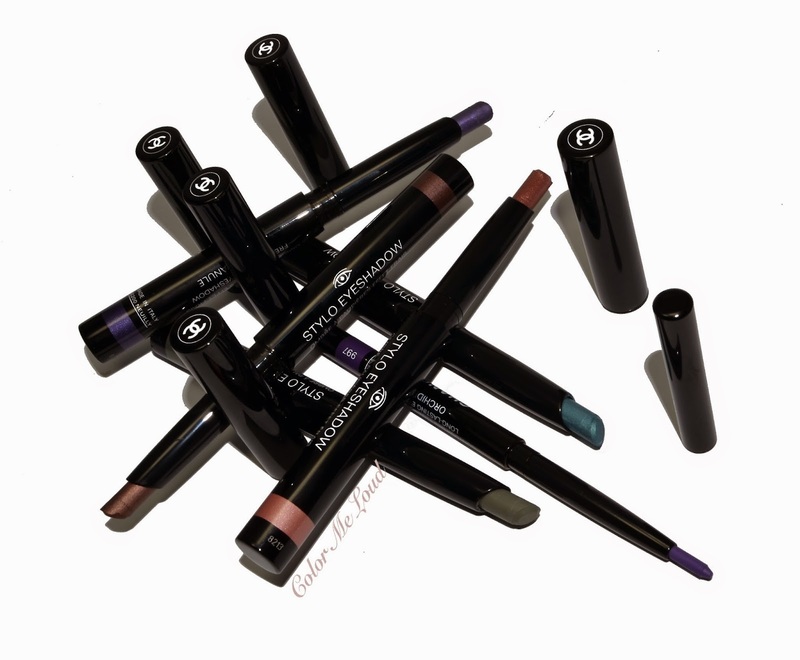 Chanel Stylo Eye Shadows come in a twist packaging with slightly angled tip which makes detailed application easier. These stick eye shadows have a cooling effect once you apply it on your eyes. It feels good if your eyes are a little puffy or of course during the summer anything cooling is welcome. Be aware though, if these get into your eyes, they make them burn so bad. So I don't recommend that you apply them on your water line. I remember this from the last release but wanted to try it out once more to make sure if they solved this issue. I wish I hadn't. It hurt so bad, I had to run to the bathroom to wash my eye with water. I recommend you do the same if it happens to you but better would be of course not to get it in there on the first place. There are five new shades, all limited edition like the last time. The shelf life of those are given to be 6 months on the packaging but I still use the ones from two years ago and they work just fine. As said, make sure not get them in your eye. I am loving the shade options here. There is #147 Caroube and #127 Laurier Rose for natural lovers. #137 Olivine has less shimmer and this green is great for an understated look with a touch of color. You can get #117 Azulejo if you want it really bright and shimmery. And of course there is a purple #107 Campanule for #teampurple and me! The finishes this time are more diverse than last time. Last time they were more shimmery, which I also liked but these are definitely more wearable. 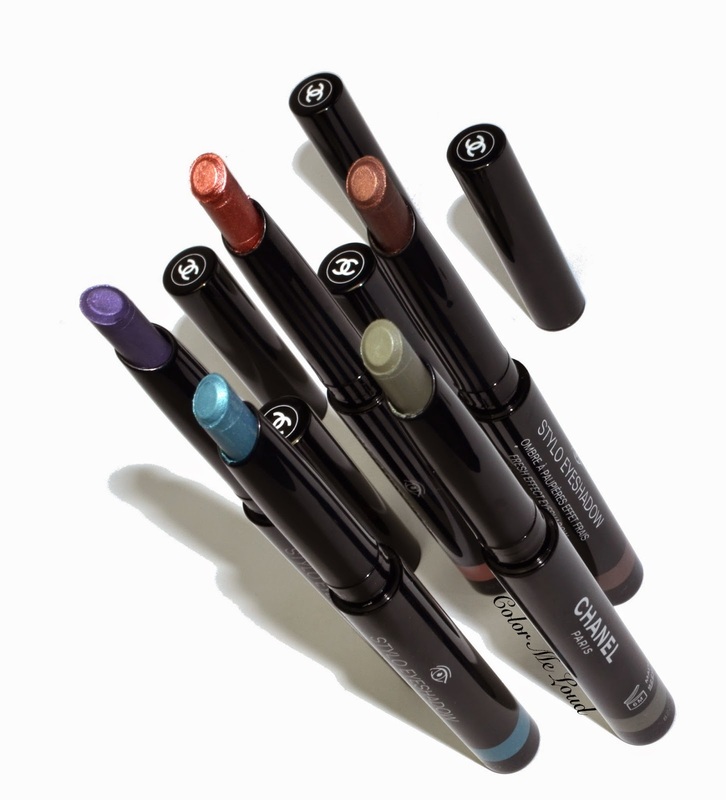 I would like to start with the most natural option, Chanel Stylo Eye Shadow #147 Caroube. This one is a gorgeous brown with right amount of shimmer. It is not too cool nor too warm but definitely has a touch of plum in there which makes me fall in love with it. Below you can see it being applied all over the lid. I blended the edges with my fingertips, then applied a touch of MAC Omega for a transition, that is it. The eye look above was for my appointment on Tuesday, which I mentioned at some point (if anyone remembers). Here is the complete look, which was with lots of browns also on my jacket and shirt. 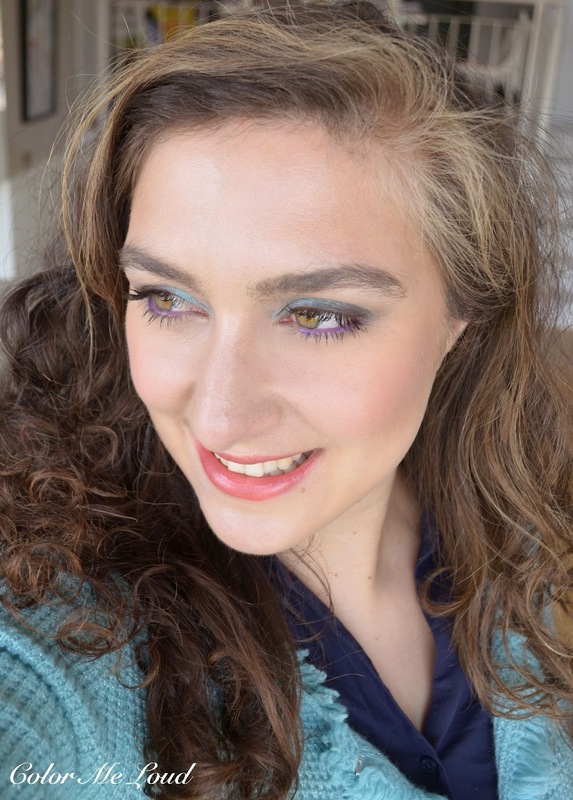 I brought in a touch of freshness by coupling the eyes with pink lips (Dior Cosmic Pink for Tie & Dye Collection, reviewed here) and on the cheeks I have the blush Pink Sunrise from the same collection. No contour here, since it may look strange from other angles in the room, I prefer not to contour for business occasions, I keep it fresh and simple. The day after the appointment, I thought I would be in for a more fun look. I applied #117 Azulejo all over the lid just to take notice that I couldn't pull it off. It was screaming a bit too much for my liking so I tuned it down with #137 Olivine over the crease and on the outer corner, leaving #117 Azulejo only along the upper lash line. I really like how #117 Azulejo combines with the Style Yeux of this collection, #997 Orchidée, on the waterline, as show below. Here is the finished look. I really like the effect of the purple on the waterline here. I was so tired that day so I forgot to note down which lipstick I was wearing. Now looking at the FOTD, I wonder, because I really like it lol. Sorry for that, I will update this post if I can remember it. My strongest candidate is Estée Lauder Envy Shine in Inspiring (reviewed here, just checked and it looks very much like this, so I think the mystery solved after all). Chanel Stylo Eye Shadow in #127 Laurier Rose is really lovely but it needed a deeper shade for definition on my eyes once applied full on. Alternatively you can sheer it down by blending by your fingers and wear it on its own. Below I combined it with #147 Caroube. It is important to mention though, these eye shadow sticks don't blend all that good into each other or with other powder eye shadows. If you don't have much time in this morning trying to make it work, it is more desirable to go with just one shade and stick to it. Here is the look you have already see on my Chanel Lumber D'Ete bronzer post. Here I am wearing Lumber D'Ete and a touch of blusher on the cheeks. 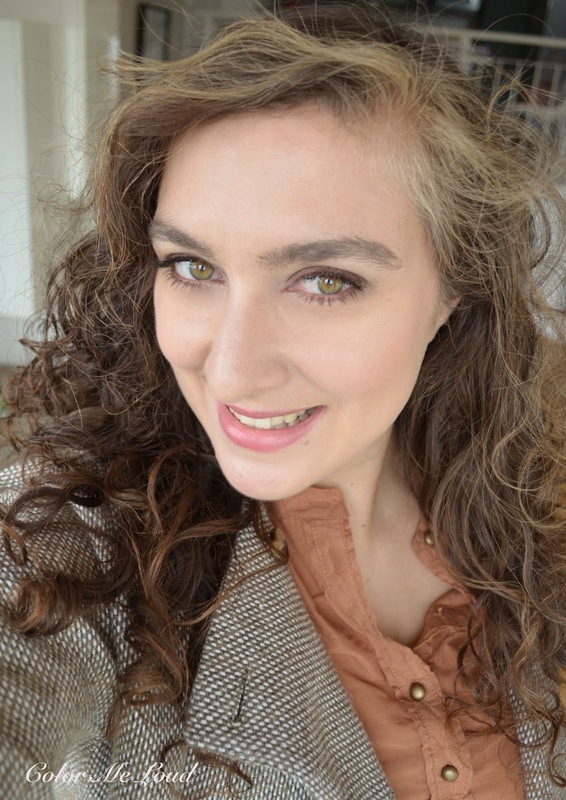 I have Rouge Coco Shine #507 Insoumise on my lips which is also from Chanel Summer 2015 Collection. 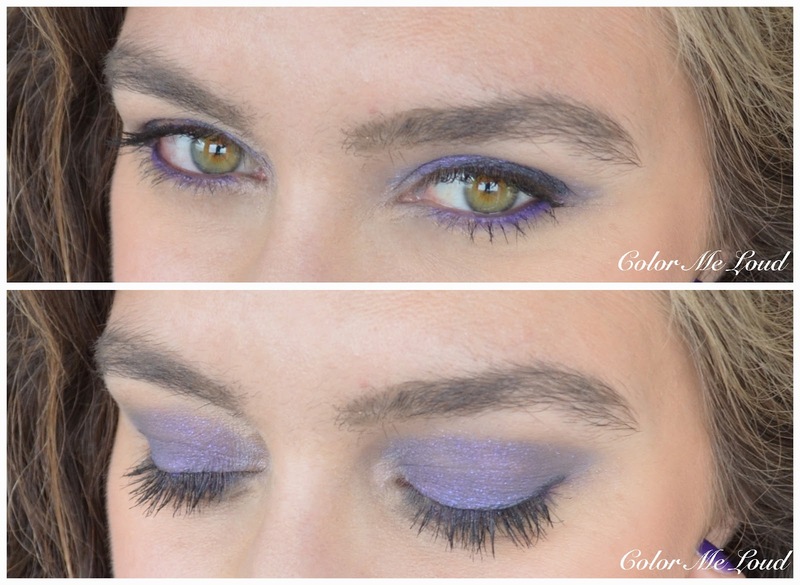 Here is the last full on purple eye look using Chanel Stylo Eye Shadow #107 Campanule. You can see that my left eye is red, this is because I got this purple in my eye as I explained above while trying to apply it on my water line. I can't emphasize more, don't do it! Anyway, I love love this purple. It has a nice shine but nothing I would call shimmer. It look so lovely on the eyes. Blending this one is a little tricky, so it is not a swipe and go shade. It is too bright for swipe and go anyway. I coupled this with Silver Black Stylo Yeux along the upper lash line and Style Yeux #997 Orchidée and Silver Black along the waterline. 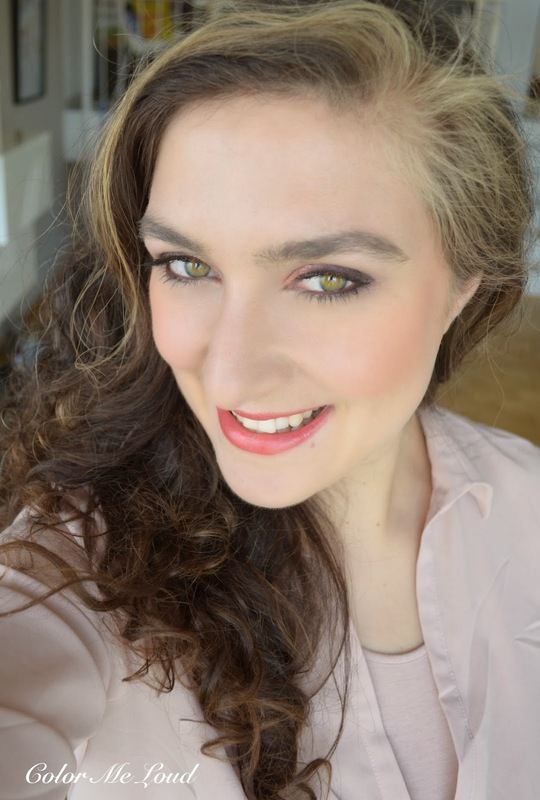 Here is the look in context with Chanel Stylo Eye Shadow #107 Campanule on the eyes, Chanel Lumber D'Ete (reviewed here) and Smashbox Fusion Softlights in Baked Starblush on the cheeks (review coming up), Rouge Coco Shine #507 Insoumise on the lips. 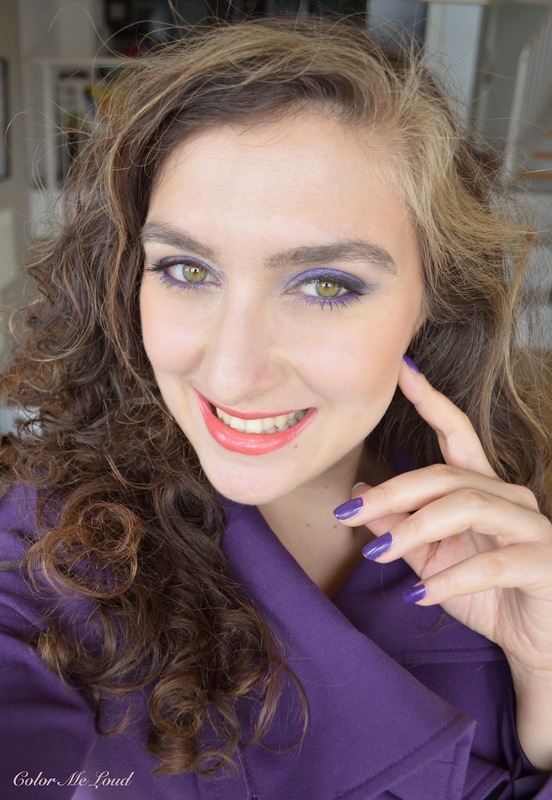 I am also wearing Chanel Le Vernis #727 Lavanda (reviewed here) on my nails to make it a death by purple look. Here are some comparison swatches of this year's Chanel Stylo Eye Shadow vs. Chanel Stylo Eye Shadows from two years ago. I swatched only similar shades (black and yellow are not there). You can see that the finish of these year's Stylos are very different, less shimmery, more wearable. The closest shade to the last release is #127 Laurier Rose, which is close to #27 Pink Lagoon but it is warmer. #117 Azulejo is more of a light baby blue once compared to #47 Blue Bay from last release. #07 Moon River was more of a taupe whereas #147 Caroube is more brown. Here is mikado's sticks inspired picture of all new shades and the new Style Yeux Waterproof. Just as a notice, these eye shadow sticks are not waterproof like the liners. I learned this while I was washing my eye after getting some of #107 Campanule inside (waterline problem) and the full eye shadow was removed without any eye make-up remover, just with water. Given this fact, now I wonder how they hold once you sweat, It is still relatively cool in Germany, so I can't put them to proper test. If you did so, please let us know in the comments below. Final thoughts: I love the shade selection of new Chanel Stylo Eye Shadows, there is something for everyone. Also this time around they are not very shimmery like the last release, so more wearable. It is important not to apply them on the waterline and these are yet to be tested for longevity in case of sweating. In normal conditions, they last whole day on me without budging. I recommend using one main eye shadow and not trying to blend too many colors to each other because it is not easy. All in all, I really like them. Thumbs up! Are you eyeing any of these? Thank you for the review and beautiful swatches. The looks you've created are stunning. I'm definitely going to get Campanule and the liner (I also really like purple eyeshadow), although I'm tempted by all of them. Hey Sara, I love the looks you came up with! I have Caroube and Campanule. I swatched the others on Saturday, but decided I don't really need any of them. I thought I might want Laurier Rose, but once swatched I just wasn't so sure at all. Did Campanule also blend out to be a bit patchy for you? It is for me, but it's not something lightly dabbing some more back on couldn't solve. Really gorgeous eye looks and FOTDs-- and so many of them-- lovely. The purple and blue green looks are my favorites on you. Especially love the purple look with Lavanda. Not surprisingly, loving cool eye looks as I do, my choices were Campanule and Orchidee and Olivine. I already got the GA Tint in Jade so I am passing on Azulejo. It can be layered very lightly for brightening.Azulejo is more vibrant for a summer look with a light tan. But for me Jade is more versatile year round. Oh! What beautiful colours and gorgeous looks! Laurier Rose looks like something I don't have yet, but I haven't been using that much of the handful of cream shadow sticks I have. I shall hold back! Especially #147 Caroube is very pretty! But I own some nice browns and I don't often use them, so I will skip it. I own the brown polish from this collection and I will buy one of the Rouge Coco Shine and that's it. Sadly most of the summer collections are to warm, brown, orange and/or blue for my taste. Yay!!! WElcome back COLORS!!! I missed seeing bright poppy colors for summer... last year's was kinda muted for me. At the same time, i'm not feeling terribly into these shades i dont know why... they look amazing on you though! Nice array of colours, you have created lovely looks with these :) I'm not sure I'll pick up anything from the Chanel core summer range but am interested in the new Les beige collection when it comes out. Colooooooor, woooooo! I really like these shades. You're seriously rocking them all. Which of course is no surprise with those gorgeous eyes of yours. I know the other shades are tempting as well. Our poor wallets. I know what you mean, there were parts on my eye lid which were a little less dense applied than the other parts. I recognized it with Campanule too but the reason, I thought, was because that shades being dark shows it much more. I think the other shades also have similar issues. As you said though, dabbing a little more and blending solves the issue. Campanula + Olivine combination is something I will test soon too! it is not very often that a high end brand comes up with crazy shades so I went a little overboard with these. I know what you mean though, they are not daily wearable, I hope they last as long as the ones from last time, which are still fine after two years lol. LOL, Les Beiges. I am probably going to end up with just the nail polishes since I collect them but other than that I will try to skip that one after going so overboard with this collection. I know what you mean though, if you buy just a few items, it is better to get the ones which you use more often. thanks for letting us know. They also last all day on me but when I tried to remove it with water, they came out so quickly, I was a little surprised. It can be though because they were not set properly yet. About Bobbi Brown, I am wearing one of their new sticks today, called Taupe. It is a matte sculpting shade and it is beautiful. It lasted all day on me and applied very nicely. Laura Mercier ones also have nice consistency, not always but usually. Chanel ones though, they burn my eyes and they apply a bit patchier than this Bobbi Brown one I have, so I guess it depends more to the shade than anything. No glitter on this one either. Which shade have you tried? Your "death by purple" pic is GORGEOUS! I can see why you like purple so much; it's a very flattering colour on you! I ended up picking up Campanule and Anzulejo, which are both out of my comfort zone. However, the SA put them on my eyes as subtle pops of colour and I ended up really liking the effect. I'm a little more adventurous in summer I think. I had been really excited about Laurier Rose, but it basically turned terracotta on my skin, so it was a no-go. Love these on you, Sara. I kind of want the pink, brown and purple, but I'm so bad at actually using cream shadows I can't justify the purchase. I love to smudge the brown all oover and into the crease and then apply the pink or purple to the middle of the lid if I'm doing my makeup at work. OMG, that purple Orchidee eyeliner is stunning!! I have brown eyes, and I know that will make them pop. Is that Limited Edition, too? Ok, I caved and ordered the Orchidee eyeliner, my first Chanel purchase ever. Can you believe it? I bought the #147 caroube today and at first use it got in my eyes. It indeed really burns like crazy! After all the tears were gone, I reapplied and I'm really happy with this. What a lovely colour! I also would like to have the Laurier Rose and the purple one. 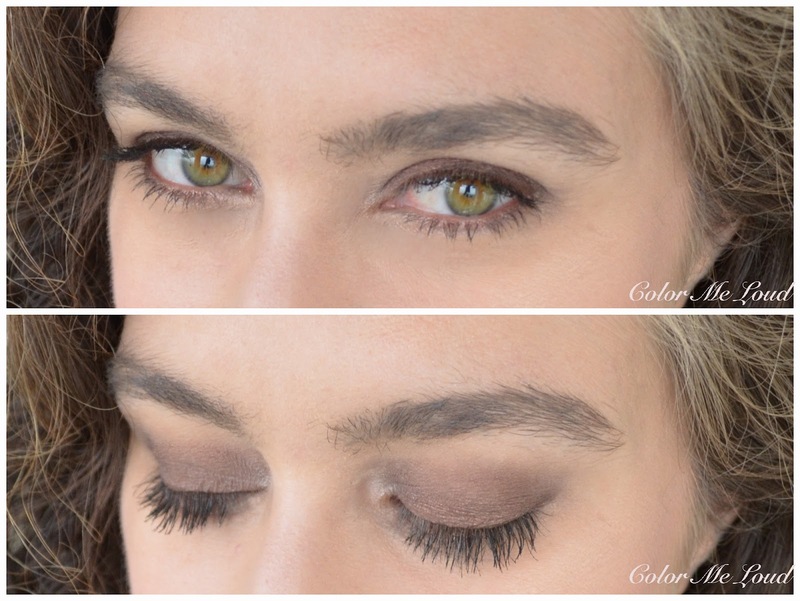 They are hard to blend, but since eyeshadows crease a lot on my eyes (and I have tried every primer there is available here in the Netherlands), this maybe could do the trick.